Like many owners of old and poorly insulated buildings, we had a concrete block building that was cold, difficult to heat and in need of upgrading. 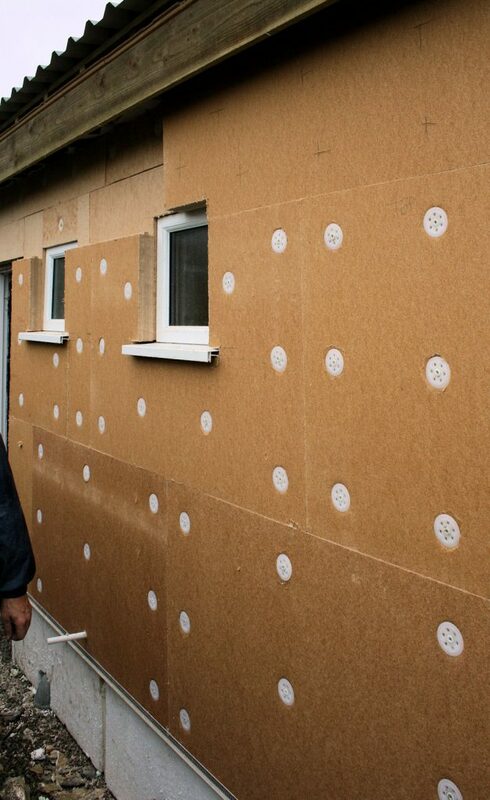 As a supplier of natural wood fibre board insulation, we chose to use the Diffutherm system when undertaking our refurbishment. Firstly, we had to give the roof a greater pitch and better overhang to allow for the external Diffutherm wall insulation. We chose Pavaflex and Isolair wood fibre insulation also from Pavatex, the details of which may be found at our case study for natural roof insulation. The walls have to be levelled to create a surface that will not leave any voids when the Diffutherm wood fibre boards are fitted. 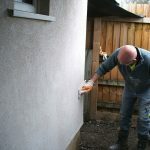 The system is breathable and would usually require a lime mortar backing. The boards are then placed onto an aluminium base rail the thickness of the boards used. In our case we chose 60 mm of Pavatherm with 60 mm of Diffutherm on top of that. The Diffutherm is tongue and grooved to allow plastering with less chance of movement cracks; it is also impregnated to give it durability for external use. The fixings are simplicity itself, just drill an 8 mm hole and hammer the fixing home. The fixings are insulated with a large plastic washer. This limits damage to the boards and also helps to improve the u-values. EXP insulation is fixed below to deal with the moisture levels better. With the boards fixed into place it is now the time to apply the special lime render. It is not advisable to apply a traditional lime mortar to these boards externally so we go with the recommended mortars for this system with Bayosan MC55 for the first two backing coats, separated by a fibre glass mesh. Mesh beads are placed around all corners and extra mesh applied at 45 degrees to openings. The first coat of MC55 is then combed and allowed to draw in to become stiff before mesh is lightly placed on the surface and allowing a void behind as a key. The backing coats are allowed to set for a day for each mm of thickness, this is typically 6mm, so we left our walls 6 days before returning to top coat. We use Bayosan SEP01 very thinly applied and then floated off to give an open texture. SEP02 can be used for a greater texture if desired but we are a smooth bunch at Mike Wye Towers so we choose a texture to fit our personalities.